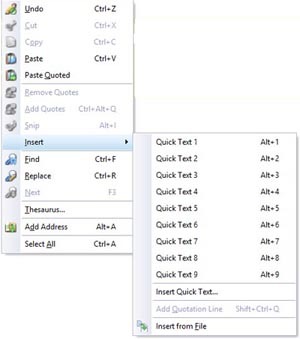 Originally intended to insert pre-composed snippets of plain-text into messages, this has become more of a "Quick Document", allowing the insertion into a message body of formatted text, by holding the ALT key and pressing the number keys 1 to 9. This can be very useful in speeding up your work. 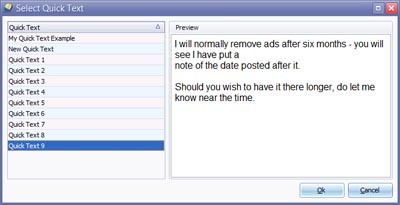 Quick Texts can also be inserted from the Message Context Menu and the Editor Menu can be customised to include them. 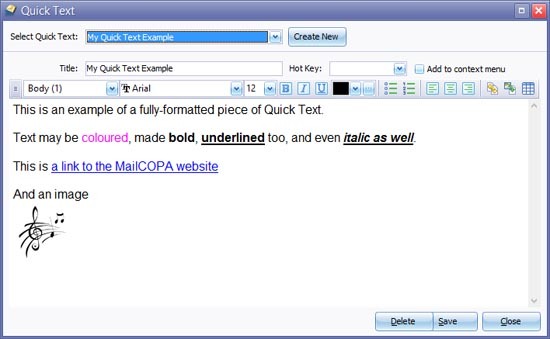 Any number of Quick Text items can be created, each may contain any amount of text, and the text can be formatted for use in HTML format messages. NOTE that all formatting will be lost in plain-text messages.